2017 saw the 200-year celebration of the description of Parkinson’s disease by James Parkinson, making this year is the first year of the third century to watch for more advances in this field. An Essay on the Shaking Palsy, a pamphlet and monograph by James Parkinson in 1817. 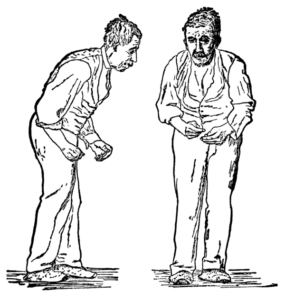 In 1817 James Parkinson, an astute observer, described clinical features of Parkinson’s disease such as resting tremor (shaking), flexed posture, postural instability and festination (quicker and shorter steps when walking) in “an Essay on the Shaking Palsy”. Jean Martin Charcot, a French neurologist, later added more description on two other important features, namely rigidity and bradykinesia (slowness of movements). These features described above remain crucial in the diagnosis of Parkinson’s disease in current clinical practice. Bradykinesia plus rest tremor, rigidity and/or postural constitute core features in the UK Parkinson’s Disease Society Brain Bank clinical diagnostic criteria. Bradykinesia is the most important clinical feature among these and despite misconception tremor is not required in the diagnosis of Parkinson’s disease, since around 1/5 of the patients do not have tremor. Flexed posture and postural instability typically occur in the later stages of the disease. A Parkinson’s disease patient with facial masking and stooped posture, illustrated in A Manual of Diseases of the Nervous System by William Gowers in 1886. While motor symptoms are the typically predominant features, and prompt most patients to seek medical attention, there are also non-motor features that are not less important. These include a wide variety of symptoms such as neuropsychiatric and cognitive features (e.g. depression, anxiety, memory impairment), olfactory dysfunction, sleep disturbances including REM sleep behavior disorder (acting out dreams during the REM sleep), gastrointestinal, urinary, sexual and autonomic dysfunction, among others. Some of these features, especially olfactory dysfunction, constipation and RBD can even predate the motor symptoms of Parkinson’s disease, making them “premotor” or “prodromal” symptoms. Study of prodromal symptoms or early identification of Parkinson’s disease in the premotor stage has drawn a lot of attention to researchers to seek news to identify Parkinson’s disease as early as possible. The major reason of early diagnosis even before patients developing motor symptoms is to study or employ disease-modifying therapies (medications that can delay the progression of the disease) to intervene early. Today, Parkinson’s disease remains a clinical diagnosis, meaning that the diagnosis is primarily based on clinical evaluation, rather than exhaustive investigations. Several attempts have been made to utilize other methods such as neuroimaging (such as MRI or PET scans) or other biomarkers (such as from blood, cerebrospinal fluid, other body fluids or tissues) to increase diagnostic yield. However biomarker studies have only been performed in research settings, not routinely in clinical practice. The landmark discoveries in treatment are the role of dopamine as a major responsible neurotransmitter and subsequent development of levodopa (Figure 3) therapy in the early 20th century and its successful clinical application in 1967. While there are also other classes of medications in Parkinson’s disease treatment, for example, dopamine agonists, selective monoamine oxidase-B inhibitors, amantadine, and others, levodopa is still respected as the most effective symptomatic therapy for Parkinson’s disease. Wide use of levodopa after 1967 led to emergence of additional clinical features in Parkinson’s disease, known as motor fluctuations. Two common forms of motor fluctuations include levodopa-induced dyskinesias (excessive involuntary writhing movements typically during the peak dose of levodopa) and wearing-off phenomenon (when levodopa does not work until the next dose). Although no curative treatment for Parkinson’s disease is yet available, basic science research in this field has been extremely active. It is important to emphasize that this does not mean that levodopa is toxic and should be avoided, as misunderstood by some. Instead, motor fluctuations should be perceived as the drug working for patients, but with responses that are not as smooth as in the early stages of the disease. There have been subsequent attempts in the field to remedy these motor complications with continuous dopaminergic stimulation (such as levodopa-carbidopa intestinal gel) and deep brain stimulation (which was already discussed in the blog by Dr. Ramdhani in 2016). There have been several ongoing trials of drugs for Parkinson’s disease. Several conducted trials and new drug approvals have been attributed to the new delivery systems or formulations of the previously known-to-be-effective medications, especially levodopa. Since levodopa remains the most effective symptomatic treatment for motor symptoms of Parkinson’s disease, several ongoing trials focus on its different drug delivery systems such as an inhaled form of levodopa. Although no curative treatment for Parkinson’s disease is yet available, basic science research in this field has been extremely active. After the discovery of Lewy body as a pathological hallmark and alpha-synuclein as its major constituent, as well as the discovery of several genetic forms of Parkinson’s disease, there has been an enormous increase in our knowledge and understanding of the pathogenesis of Parkinson’s disease. However, the most important question that remains to be answered, as in all neurodegenerative disorders including Alzheimer’s disease, is “what is the major cause or trigger of neurodegeneration in Parkinson’s disease?” I strongly believe that the closer we are to the answer to this question, the closer we are to the curative treatment of Parkinson’s disease. This is our goal in this third century! Dr. Pichet Termsarasab is an Associate Editor of the Journal of Clinical Movement Disorders, and a visiting scholar in the Xinglong Wang Laboratory for Neurodegenerative Diseases at Case Western Reserve University, Cleveland, Ohio. His research interests are phenomenology and genetics of movement disorders including Parkinson’s disease and a variety of hyperkinetic movement disorders such as dystonia, chorea and myoclonus, as well as the pathogenesis of neurodegenerative disorders.